Tragically, there was no shortage of dogs to be rescued. The list was so long in both the retriever and shepherd websites I had perused that I lost much sleep as I poured long into the night over the pictures and profiles of abandoned pets. I was fairly sure I wanted a dog who was older, but not so old that it couldn’t go backpacking or hiking. I definitely didn’t want a puppy. I am still reeling from our Labrador’s puppy stage that ended a couple of months ago after an extended six-and-a-half-year preadolescent phase of destruction and general mayhem. To be honest, I fondly refer to him as a wannabe rescue dog. I’m sure anyone else would have given up on him long ago. Once started on the rescue sites, I would begin looking at the four and five year olds who seemed to fit our needs. Soon, however, I would start to click on the ten, eleven, and twelve year olds and my heart would start to break. Their story was always a variation on a theme: family forced to give up dog — good with kids, loves to chase a ball, etc. I just couldn’t imagine what kind of tragedy happened that would force a family to let go of its beloved pet after so many years, leaving it to end its days longing for its owners to come back and bring them home. Barely able to look at the page by this point, I would end up looking at dogs with the word “hope” for their last name, as in Maggie’s Hope or King’s Hope. It turned out that these dogs had serious behavior issues and needed a miracle worker to come to their rescue. By one in the morning I would find myself distraught and convinced that one day I was going to be that news story about the old guy found living in a double wide on some parcel in the country cohabiting with 40 or more dogs among the linoleum and avocado shag carpet. Rescuing a dog sounds so heroic and it eased any qualms I had about bringing another dog into the house by the “doing the right thing” feeling it gave me. Just the idea made me feel down right noble. Then, I met up with my first dog rescue organization. These organizations often find and save dogs just minutes or hours away before “going to the farm.” Then countless volunteers take these lucky dogs to a kind of rescue limbo where they live with foster families or in large kennels while they wait for their forever home. To get one of these dogs, you have to apply and survive an arduous and humbling clearance process. The quality control team, an older couple, arrived with their two very large and very rambunctious dogs. They needed to see if Truman would take kindly to other dogs. He did, and the three of them tore up the house while the couple grilled me on my exercise habits, work schedule, dog food, types of dog training I had used, etc. They would dismayingly look askew at each other after my every attempt to assure them I could keep a dog. I started to doubt my ability to raise Andrew, let alone another dog. Finally, I just told them about every thing Truman had destroyed and pointed out that he was still alive and living with his first family. That seemed to appease them and they pulled out measuring tapes and started to measure rooms, back yard space, and fence height. Somehow, we passed. The first adoption possibility that came up was a German Shepherd rescue in downtown Los Angeles. They had determined that we were not fit for a young dog, but could possibly get a middle-aged mascot. This was fine with me. The problem was that any dog that fit the bill was just down right ugly and Andrew would have nothing to do with them. Secretly, I was glad to have Andrew to blame for not wanting them. We weren’t in any hurry and decided to go back the following week. Again, we spent a couple of hours meeting and greeting different dogs. However, each time Andrew pointed out one that he liked, the rescue said they were not a good fit. We were about to give up again, when they brought out a gorgeous petite Shepherd, Ivory Von Schtudnizt, who came right up to Andrew, stood on her hind legs, wrapped her front paws around his neck and kissed him right on the lips. Andrew’s eyes lit up and I knew the search was over. Our only problem was that she was less than a year old, full of energy, and a bit skittish. Everything they said we couldn’t handle and everything I didn’t want. Finally, it was determined that we could foster to adopt, a sort of “money back guarantee” if things didn’t work out. Even before we got home, Andrew had chosen Maggie as her new name. My mom had mentioned that it was President Truman’s daughter name and Andrew liked the connection to our other dog, Truman. I tried to brainstorm a few Germanic sounding names, but he was settled on the name and wasn’t interested. We got her home and made sure all gates and doors were secure. We weren’t going to take any chances this time. And then we started to fall in love. Maggie turned out to be a “cuddler” and lover extraordinaire. No matter where we went, she was there pressing all of her 55 pounds as close to us as she could, and she wouldn’t let us out of her sight. This was good because we were determined to not make the same mistake we did with Teddy and we kept close tabs, even keeping her attached to us with a leash in the house when we couldn’t give her our full attention. On the fourth night at home, we were watching TV with Maggie cuddled up between us on the couch when our downstairs neighbor decided to come up and check on the new addition. As he walked up the back stairs, the dogs began barking at the intruder. Upon seeing who it was, Truman changed his tune to a tail wag. Maggie, on the other hand, took one look at John’s six -foot -four, 240-pound frame and peed on the spot. Then she hightailed it straight through my bedroom, down the hall, through the living room, and made a great leap out an open second story window and into a tree . She scrambled her way down and shot off into the dark. By the time we realized what had happened, she was gone and out of sight. I saw the utter shock and disbelief in Andrew’s eyes. I held my head in anger, frustration, and fear. Somehow, we had managed to lose two dogs within a couple of weeks. With heavy hearts, Andrew got on his bike and I got in my car and we took off into the night calling out for a dog with a name she barely recognized and in a neighborhood surrounded by some of the busiest streets in Los Angeles. Teddy may have survived a night in the canyon without getting eaten by coyotes, but I had no hope Maggie could survive even twenty minutes on La Cienega Blvd. Part IIII and the last installment on this story and theme coming very soon. Andrew loves biscuits and we both love tomatoes. When I saw this recipe in the August Bon Appetit (which comes in July) I knew we would like it and, sure enough, it has quickly become an Andrew favorite. I like it, because I can come home and put it together with relative ease on a weeknight. We have tried it with a variety of cheeses and using different herbs. The original dill is good, but we like substituting basil too. It’s not low calorie, but Andrew is running cross-country and always starving and I just cut a smaller slice. I serve it with a big green salad and call it a night. This is a very wet dough and needs refrigerator time. I sometimes add fresh herbs to the crust mixture as well. Thyme, basil, and dill work well. Note: I like to use Lily White Self- Rising flour for my biscuits if you can find it. It’s a popular brand from the South used widely for biscuit baking. If you don’t have self-rising flour combine 2 cups of flour, ½ tsp. baking soda and ½ tsp. salt and you will be just fine. Using your fingertips or a pastry cutter, rub or cut in butter until the mixture resembles a course meal and some small lumps remain. Stir in the buttermilk and knead gently with your hands until dough forms. This dough is very wet and will stick to your fingers. Clean your fingers, wrap the dough in plastic wrap and chill for at least an hour. While the dough is in the fridge, lay the tomato slices in a single layer on a baking sheet lined with 2 layers of paper towels. Lightly salt the tomatoes and cover with 2 more layers of paper. Let stand for at least 30 minutes and up to 2. The flavor will concentrate as the tomatoes loose some of their water. Preheat the oven to 425. Roll out the dough between 2 sheets of plastic wrap or wax paper to about an 11 inch round. Remove to layer of plastic and invert the dough onto pie dish. Carefully peal off plastic wrap. Little bits of dough may stick to the plastic, but just scrape them off afterwards and stick them to bottom layer of dough. Combine cheeses in a bowl and reserve ¼ cup for topping. Whisk together mayonnaise, scallion, dill (or basis if using), vinegar, sugar, salt, and pepper in a small bowl. Fold overhanging curst up and over the edges of the tomato slices and back until crust is golden and cheese is golden brown, about 35 to 40 minutes. Check half way through and cover with foil if it is getting too dark. If you have the time, let cool for an hour or up to three. Andrew is always hungry by the time it comes out of the oven and we usually eat it warm and gooey. It will firm up over night and makes a great lunch the next day. How can you make a post about food when you loose your dogs?? LOL I totally know how you feel. However, I am writing in retrospect and not in real time. My summer has been a very difficult one with with family illness and run away dogs. However, Feeding Andrew is a blog about raising my son and the food I feed him. Sometimes the recipe has a direct connection to the story and other times, like now, it does not. 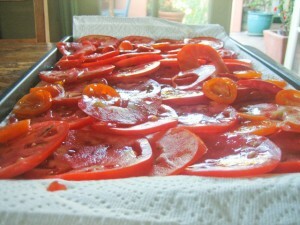 Currently, I’m posting recipes that have tomatoes as a common thread. I don’t want to spoil the end of the story, but you did remind me that I forgot to put that there is a part 4… and it’s coming soon. I’m sorry, I didn’t mean that. Can’t wait for installment IIII and hopefully a happy ending. 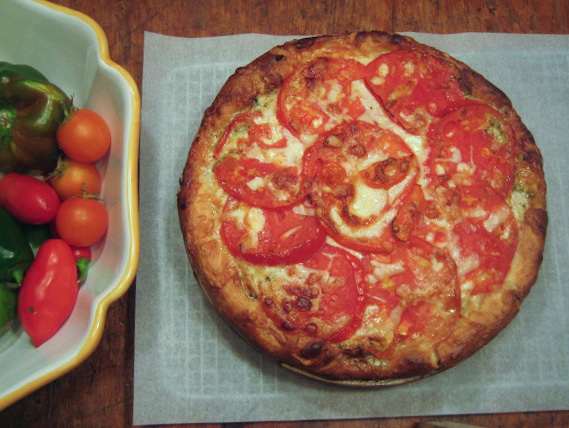 I made a tomato pie this summer too. Actually several. My recipe came from the local newspaper (Virginian Pilot). It is very similar to yours. 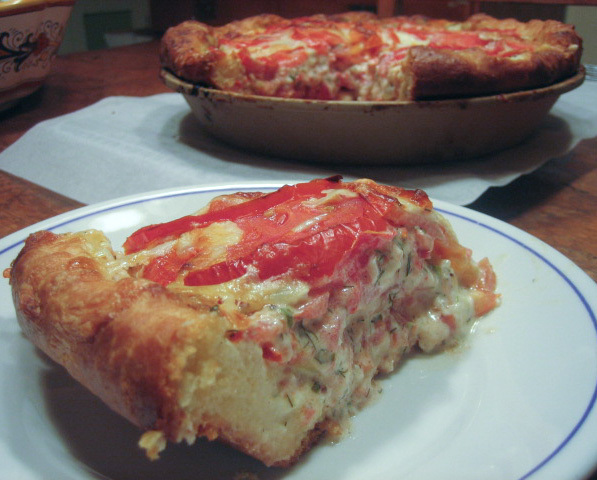 The first one I made was so amazingly good, I made another two days later…but I skipped the crust. It worked just fine and wasn’t as heavy. My recipe adds lemon zest to the mayo mix which is a yummy addition. I also used basil, since that was growing like crazy along with the tomatoes in my garden. I seeded my tomatoes by cutting in half before slicing and scooping out the seeds with my fingers. It helped with some of the extra moisture in the tomatoes. Yumminess.